Now – prepare a smoother, cleaner, better seed bed with less work, with the Culti-Leveling Attachment. The 3 or 4 bar attachment features staggered tooth bars. We have a selection of 4 models of carrier arms, for use with the 3 bar coil tine harrow sections. 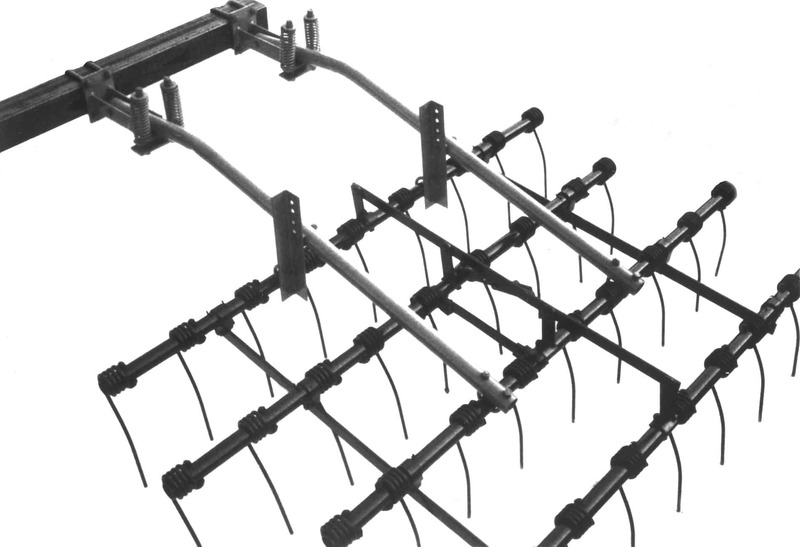 Full floating – Each harrow section is independently mounted. This allows free rise and fall of the harrow so it follows the contour of the ground, overcoming any problems of clogging and allows trash to flow freely through the harrow section. The three or four bar Culti-Leveling Attachment prepares an excellent seed bed by leveling and breaking up ridges in one operation. This process conserves essential soil moisture. Designed to mount to the rear beam of 3” square beam field cultivators. For 3-bar Coil Tine harrow sections. Designed to mount to the rear beam of 2 1/2” square beam field cultivators. For 3-bar Coil Tine harrow sections. Designed to mount to the rear beam of 4” square beam field cultivators. For 3-bar Coil Tine harrow sections. Special, heavy duty, spring loaded arms, designed to mount to the rear beam of 2 1/2”, 3”, 4”, 5” and 6” square beam field cultivators. For use with 3 or 4-bar Coil Tine harrow sections.